San Francisco writer, publisher and humorist Robert Wayne Davolt, 47, died on 16th day of May, 2005, after a brief battle with cancer… in which, obviously, the cancer came out slightly ahead. Born in Renton, Washington on June 27, 1958, Davolt began early, publishing a neighborhood association newsletter at 15. While still in high school, he broke a major labor story in his school newspaper, winning grudging praise from the major daily papers that he had scooped. At 17, he joined the U.S. Navy, stationed on small ships patrolling the South Pacific and Indian Oceans. Davolt continued writing in the service and the travel articles he sold about his various ports of call began a nearly 30-year free-lance career. After honorably completing his enlistment, he returned to Seattle and attended Highline Community College, earning two degrees and teaching two quarters of basic journalism as the Coordinator of Student Publications. He also won recognition from the Washington Press Association for his humor columns, cartoons and investigative reporting. In 1983, he moved to Columbia, Missouri to complete a bachelor’s degree in Political Science at the University of Missouri. Relocating to Madison, Wisconsin upon graduation, he created advertising for Caterpillar engines and equipment until 1996 when the opportunity came to return to the West Coast and manage the infamous Drummer magazine, based in San Francisco. Davolt quickly rose to become CEO, publisher and editor of the publication, as well as executive producer of the International Drummer Contest, held annually in San Francisco since 1981. 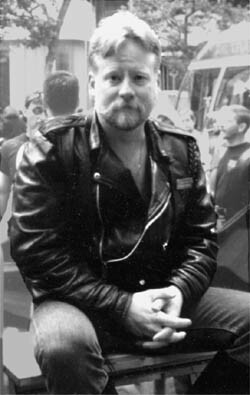 In 1999, he returned to free-lance writing, design and editing, his work appearing in such diverse outlets as the San Francisco Examiner, SF Frontiers, the Bar Area Reporter, OutNow, the Leather Journal, Blueboy, Numbers, SuperMR, Bound&Gagged and the Official Folsom Street Fair and Castro Street Fair Programs. His regular online column had a readership among the international gay leather community of nearly 125,000. In 2004, critics praised the release of his first book “Painfully Obvious: An Irreverent & Unauthorized Manual for Leather/SM,” nominated for an American Library Association Stonewall Book Award.